Architects are the one who plan, design, and supervise the construction of the buildings. 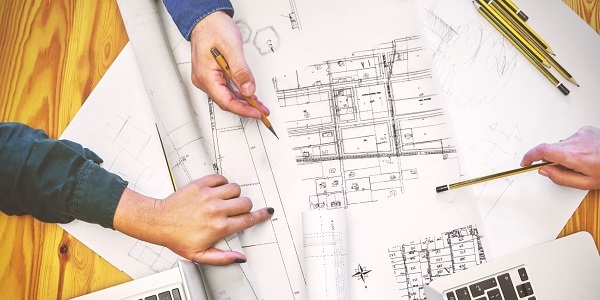 An architect is the one who develops the building, so it’s his responsibility to look after the safety concerns and for taking up this task he/she should undergo professional training in the field. This is how the person will be eligible and will acquire a license to work in the field. Proper knowledge is necessary to practise architecture. They have to meet the needs and requirements of their client’s and build appropriate design. Before designing starts there are many parameters that are to be considered as we have to analyse the site, carry out meetings with our clients and stakeholders for proper planning and projection. We at Interior9 aim to provide 360 degree service to our clients so that they don’t have to think twice before signing a contract with us. We are the best architect in Mumbai containing entitled license to carry out the project. In such cases it is always better to hire a professional who knows their working in and out. This ensures quality and in-time completion of work which is very important in today’s world. If we do not hire a professional the construction may later cause a lot of problems for the people residing in it. Hiring a professional will terminate such possibilities and will deliver quality results. They are the all-rounder as they look into each and every inch that has to be built. Be it remodelling, adding on or building from scratch an architect can always guide the way. Contact us for architect Navi Mumbai. What if you want to add space in the existing place? Confused how will that happen? Well architects are there to solve the problem as they are trained professionally to do so. One won’t even think something like this is possible; the way how a professional architect works. They come up with many solutions to the same problem and then the client decides to choose the feasible one. The Interior9 architect in Mumbai manages every situation calmly. They are professionally trained to solve the problem in the most creative way possible. They comprise of immense knowledge about the construction and the design layout. If there is a specific design in someone’s mind then architects make sure to turn that thought into reality. How can one find a good architect? Every individual has a different thought process while looking at things. Same theory applies here, so make sure the architect you hire has the same style as you. This is how you will know if the architect is good or no. According to what you have in mind like if you want to increase space in your home, you’re spending limit, about the finance. All these things can be clarified with the help of an architect. He will have an answer to all your questions and you will be left with no doubt. Friends and relatives can help you reach good architects and you can also make a list of the architects whose designs you admire. This can also be one of the factors of knowing if they are good for you. We at Interior9 entirely understand our clients’ needs and aim to work towards it. Looking for architects in Mumbai? Contact us. There are a few steps involved in every activity, so let’s jot down some steps towards helping you build your dream. We follow a process to keep everything in line and avoid conflicts. Interior9 architect Navi Mumbai is the place you are looking for. •	First - Is deciding what to build – Our process first step is to understand what one aspires to build. So firstly we sit with the client and discuss all the points under that. •	Secondly - Showing a design sample – After knowing what has to be built we go on further with designing samples and examples like rough sketches and take our clients views and opinions about it. •	Thirdly – Developing the design – Here we refine the each and every design thoroughly and finalise the designs for spaces which are required to be constructed. We mention the correct shape, style and size of the room and also list down the material which will be used. •	Fourth – To prepare construction documents – Once the design approval is completed, we go further with making a detailed construction specification, as this will further be added to the building contract. •	Fifth – Contractor – At interior9 we provide 360 degree service to our clients and the client does not have to go to someplace else to find the contractor. We are the best architect in Mumbai with an aim to provide everything from our end. •	Sixth – Construction Management – A contractor is the person who has to manage the procedure that is taking place and on the other hand architect will come and supervise the project and keep the homeowner updated. Feel free to contact us for further details	. We are here to make you feel the essence of architecture and how it can change your life structure.